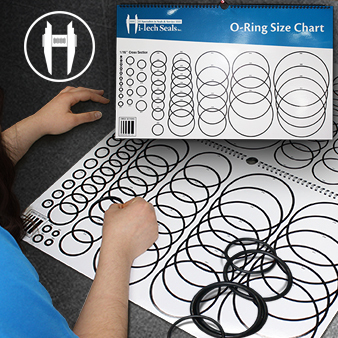 With our O-ring size charts, you can hold up your O-ring against the chart and determine the size of your imperial O-ring. This chart includes sizes from O-ring series O, 1, 2, 3, 4, as well as O-rings for tube fitting bosses. Our O-ring size charts also offer information on groove design, material, and Hi-Tech Seals’ manufacturing capabilities. Check out our PDF for more information. O-ring cones are ideal for measuring standard AS-568 O-rings. It measures 184 widely used sizes from 1/4" thru 5-5/8" ID, in five standard cross-sections. 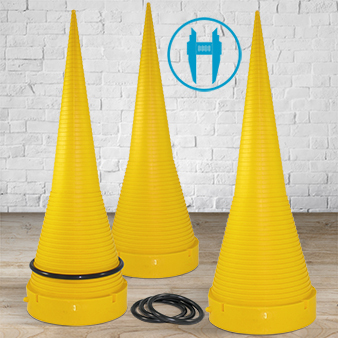 The O-ring cone stands 17.5” tall. 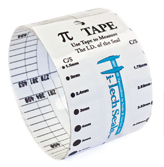 Pi Tape® is used to determine the imperial or metric size of an O-ring. Determine the cross section or series of the O-ring using the cross section graphics. Then unwind the Pi Tape® on the inside diameter of the O-ring to determine the imperial part number or the metric inside diameter.